Pick your own Pumpkins Straight off the Vine! There is nothing better then spending a fall day at Stowe Farm picking your own pumpkins! Here at Stowe Farm we are dedicated to giving you the most authentic fall feeling possible! Sure, you could go to your local grocery store and buy an already picked, but it 's just is not the same! Half the fun of carving that perfect Jack-O-Lantern or cooking that special pumpkin pie is the story that goes behind it. 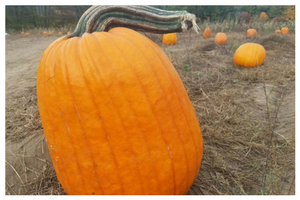 There is no better story to tell then how you picked your very own pumpkin at Stowe Farm. Children, parents along with grandparents enjoy roaming the patch to find that perfect one. Which pumpkin will look the best on the front steps? Which pumpkin will be the best for carving that special face. Others look for the smallest pumpkin for the baby to carry while some want the biggest in the patch. Our Pumpkin patch will be bursting with pumpkins of all shapes and sizes from small perfectly round ones to large jack-o-lanterns. Most of all, look for the great stems! 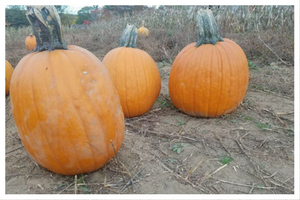 Large , strong stems make for an outstanding looking pumpkin. Stowe farm pumpkins are planted Memorial Day , cared for day after day until mid September. Official first day for picking September 14, 2019 . Open every Saturday & Sunday 10am-5pm until we sell out. Pumpkins are great addition to school groups tours. First of all, a wagon ride to the patch, then they scamper around looking for that special pumpkin to bring home to show their family. Finally snack time for each child to relax a moment before heading back to school. Birthday parties are another way to have pumpkin picking part of your special day. 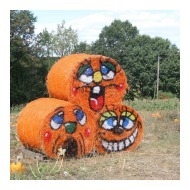 Many children have enjoyed painting pumpkins right here at Stowe Farm . Families year after year come back to make new memories, make this year your turn. Pumpkins will be growing again this year! School Groups and Pumpkin Parties! 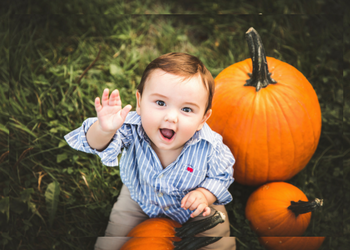 Our pumpkin patch makes for a great destination for both school groups and birthday parties! Check out our Group Events page(s) to get all the information and to possibly reserve your spot to have the best Halloween party ever! Picking that perfect pumpkin is fun for the entire family, but most of all , that perfect picture. Whether you're here on a weekend or want to come for a private photography session, it will be picture perfect. Stowe Farm sends out care packages to the troops overseas. We offer free entry for Veterans & Active Military personnel with a service ID. Make sure to contact and speak to Maura to confirm your purchase.